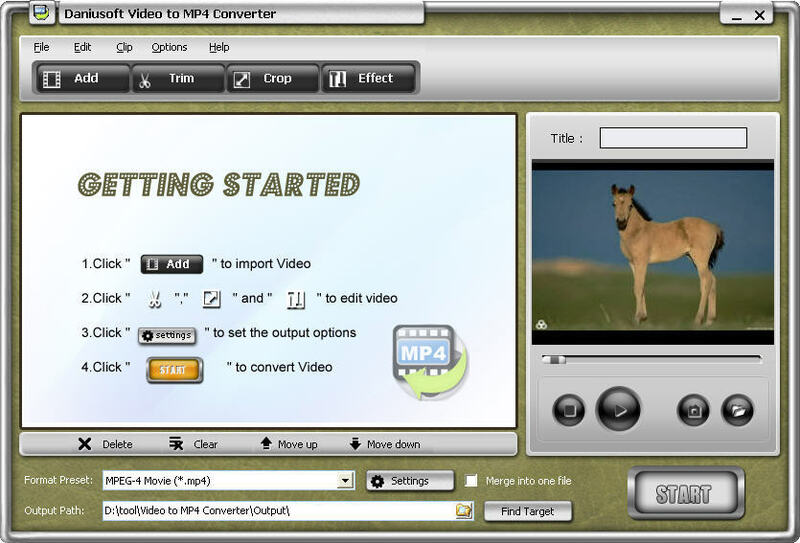 MP4 Converter - a video to iPod converter support convert popular video formats: *.avi, *.wmv, *.asf, *.asx, *.mpg, *.m1v, *.m2v, *.m2p, *.vob etc. to MP4 iPod video format. It has DVD to MP4 Converter and MP4 Video Converter. Support Convert limewire Youtube to MP4, rip dvd to mp4, and convert most video formats such as AVI, WMV, Divx, XviD, MPG, MPEG, DAT, RM, RMVB, MOV and ASF to MP4. Wondershare Mp4 Converter Suite includes Wondershare DVD to MP4 Converter and Wondershare MP4 Video Converter.It supports various mobile devices such as iPod, PSP, Apple TV and iPhone with excellent playback quality. Daniusoft Video to MP4 Converter is an all-in-one and fast video to MP4 Converter software. It can converter AVI, MP4, MPEG, WMV, XviD, H.264, DAT, MOV, ASF and FLV, etc. to MP4, AVI, M4A and rip video audio to MP3, M4A, AAC. MP4 to MP3 Converter is designed to convert MP4 to MP3, it can also convert most popular video formats to MP3. Supported video formats include AVI Video (*.avi), MPEG Video (*.MPEG, *.MPG, *.MP4, *.M1V, *.M2V, *.M1P), DVD Video (*.VOB). Convert VOB to MP4, MPEG to MP4 for MAC, and convert AVI, 3GP, MOV, MP4, M4V, WAV, WMA, M4A, AAC, MP3, MP2, 3G2, AC3 to MP4 video and audio formats directly like MP4, AVI, M4A, AAC and MP3. ViVi MP4 Converter provides you with a integrated set of tool to convert Avi, Divx, Wmv, Asf, Mpeg-1, Mpeg-2, etc video format to Mp4 video format.